Yang Guang (Sunshine) had both testicles removed in the surgery and Edinburgh Zoo will now explore future breeding opportunities. As Tian Tian prepares to give birth, Edinburgh Zoo's giant panda is spending more and more in her private show den. So staff have set up panda cam so anyone can watch her as she readies herself for motherhood. Watch it here. Visitor numbers soared after the December 2011 arrival giant pandas Tian Tian and Yang Guang at Edinburgh Zoo. Now Tian Tian is pregnant and expected to give birth sometime soon, another chapter will open up for the popular pandas. December 4 2011: The two pandas arrive in Scotland on a Boeing 777F flight dubbed the "panda express." February 2012: The zoo says visitor numbers are up 200% thanks to the pandas. Around 70,000 people have seen Tian Tian and Yang Guang since their arrival. April 2012: The pandas are brought together for the first time in a "love tunnel" as Tian Tian is judged ready to mate. Three days later the zoo says "sparks flew" between the pandas but they failed to mate. April 2013: The zoo announces Tian Tian was artificially inseminated after she displayed behaviour not "conducive to mating." October 2013: Zoo officials say Tian Tian's behaviour indicates she is not pregnant. April 2014: Tian Tian was artificially inseminated again after she failed to mate naturally. August 2014 Zoo officials say scientific data suggests Tian Tian is now pregnant and could give birth before the end of the month. Edinburgh Zoo has announced that its latest scientific data suggests Tian Tian the giant panda is pregnant and may give birth at the end of this month. Iain Valentine, director of giant pandas, said: "It is very likely that we will not know 100% if Tian Tian is pregnant until she gives birth; however very new scientific tests will give us a strong indication". Last year, Tian Tian became pregnant through artificial insemination, but lost the cub at a late stage in her pregnancy. The first koala to be born in the UK has enjoyed his first experience playing outdoors in the sunshine. Yooranah was born at Edinburgh Zoo in May last year and has been waiting for the weather to warm up before being allowed on the outdoor koala climbing frame. The koala joey was born the size of a jelly bean so keepers thought Yooranah was previously too young to be let loose in the outdoor area. When the weather is good the keepers take the koalas out of their heated enclosures to soak in some vitamin D from sunlight, while enjoying the sights of the zoo from their perch. The UK's only female giant panda has been artificially inseminated after failed attempts to help her mate naturally. Edinburgh Zoo bosses were hopeful that Tian Tian would mate with her intended partner Yang Guang this year. But after her hormone levels started to fall quickly they turned to artificial insemination, using samples from the male. 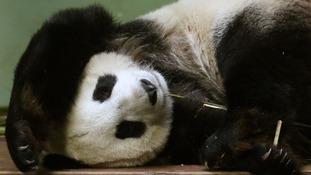 Experts say they will not know for certain whether Tian Tian is pregnant until she gives birth, which could be in August or September. 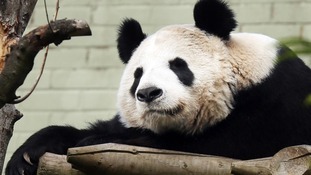 The giant pandas at Edinburgh Zoo will be ready to mate within two weeks, keepers have revealed. They hope Tian Tian and the zoo's male panda Yang Guang will produce a cub this year as the creatures both start to show the tell-tale signs that they are ready to breed. There was disappointment last year when the pair did not mate, and although Tian Tian was artificially inseminated, she lost her foetus at late term. Experts will watch Tian Tian's behaviour closely to gauge when her 36-hour breeding window begins. Tian Tian (Sweetie) and Yang Guang (Sunshine) are the first giant pandas to live in the UK for 17 years. They arrived on loan from China in December 2011 and will remain at Edinburgh Zoo for a decade. Zoo keepers have begun a daily monitoring of the UK's giant panda couple as mating season approaches. Edinburgh Zoo hopes Tian Tian and Yang Guang will produce a cub this year as the creatures start to show the tell-tale signs they are ready to breed. There was disappointment last year when the pair did not mate and though Tian Tian was artificially inseminated she lost her foetus at late term. Zookeepers are getting their first proper look at a koala joey who was born in May, but has only recently emerged from his mother's pouch. Tian Tian had been keeping keepers at Edinburgh Zoo guessing over her possible pregnancy since she was artificially inseminated in April. In August, experts noted signs that she was pregnant and it was hoped a panda cub would be born by September and the panda enclosure was closed three weeks ago. Newsround turns 40 - but how will it handle the pandas?